Factories play an important role in India&apos;s rural economy. They provide jobs for local men and women, which translates into money to buy food, send kids to school, buy medicines if needed, repair and maintain a house and save some money. Villages and towns in India (as elsewhere in the world) don&apos;t need an handout, they need a hand-up! People are willing to work hard, but they need jobs with good working conditions and a decent pay. And customers who are willing to pay a fair price for their products. On every visit to rural india my ears are alert for news of well run companies creating jobs for locals. 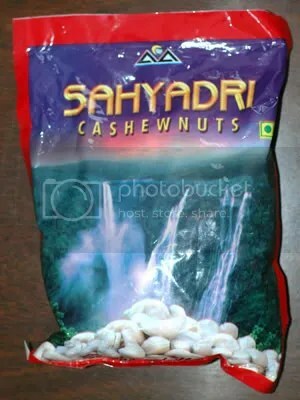 In the Konkan town of Kumta, I visited the Sahyadri Cashew Processing factory run by Mr Murlidhar Prabhu. He is a relative of a relative. I was particularly impressed that he hired a lot of women in his factory. Of the more than 250 people he employs, only 8 were men and more than 240 were women. WoW! “But do they like working here,” I asked. “Most of our new workers are younger daughters, sisters, and relatives of those already working here,” he explained, implying that if the pay was not good, or work conditions onerous, workers would not be bringing other family members in to work. Within a few years of working the women are able to save a decent amount of money. They generally leave when they get married and move out of town. Their ability to earn a living also makes them more marriageable, to a better person and gives them the confidence to seek other jobs wherever they move. We need more such social entrepreneurs in the villages and towns of India. No! We do not need more television sets, or dainty models selling shampoo, or fancy soaps. Certainly not coffee shops or liquor bars or &apos;menthol&apos; cigarettes or posh grocery stores. So the next time you munch on the nuts, remember all the folks working in the factories in rural india and elsewhere whose job depends on your choices. Did I mention nuts are actually very good for you? The hard, gray, raw cashew seeds, perched below the fruit are collected and dried. Seeds are first steamed and allowed to cool in large heaps on the factory floor. The quick heating and cooling causes the kernel to separate from the shell. Operating steam boilers and loading /unloading large bags of cashew seeds was the only tasks in this factory performed by men. Women handled all other jobs here. After cooling, women on tables with rudimentary cutters expertly position each seed in a v-grip using the hand lever. Then a foot operated lever snips the outer shell longitudinally in half. Cut seeds tumble through a hopper to a basket on the floor. … where another woman separates the whole nut kernel from the shell. The gray shell has corrosive agents and women rub oil on their hands to protect from the corrosive effects. The shells are sold off to companies which extract oils, which are apparently an important ingredient in marine paint used on ships and docks. May explain why most ships are painted gray? Collected nuts are dried in an oven, making the skin brittle and easy to remove. While I suffer at this chore, the women fly through at a dizzying speed. They use a tiny knife to scrape and release the skin on the inner surface of the nut. Then the rest of the skin just falls off. 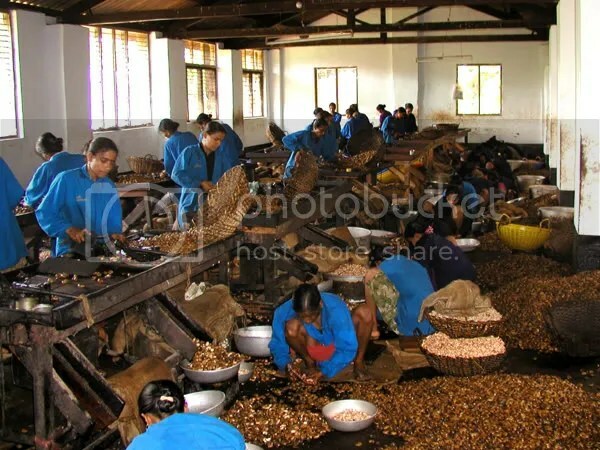 Preliminary sorting of the nuts is also performed at this stage. 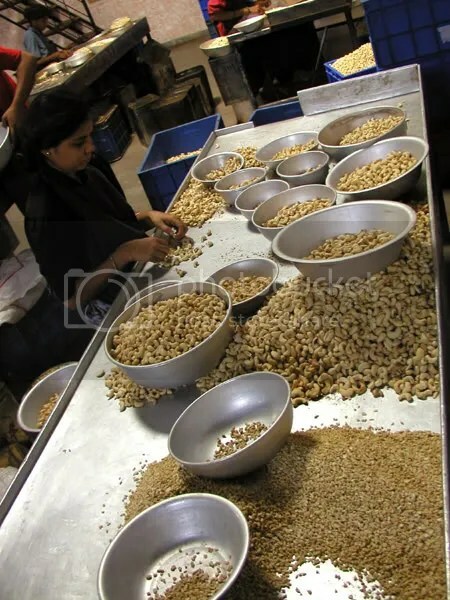 On these tables the cashew nuts are sorted depending on their size, colour and if they are chipped. Halfs and pieces of nuts are also sorted by size. This grading determines the ultimate price of the cashew nuts. The sorting tables were in a large well-lit area. 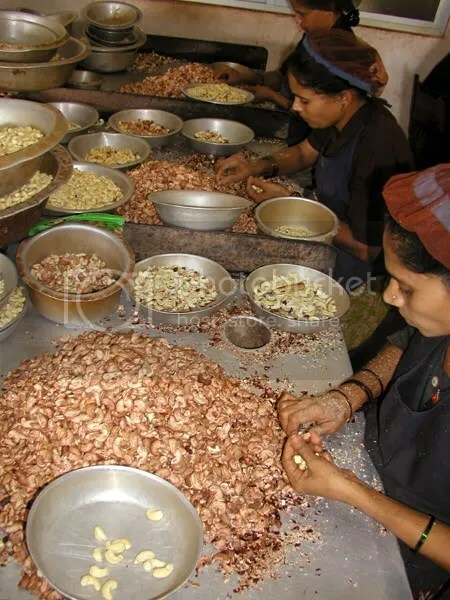 The cashew nuts undergo extensive quality control before packaging. 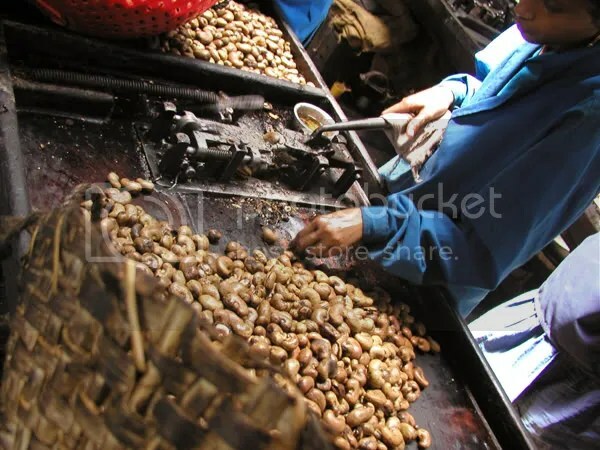 Nuts are placed on a conveyor belt and inspected. Over a sieve, dust and other contaminants are sucked. Over a magnetic table, metallic contaminants are removed. 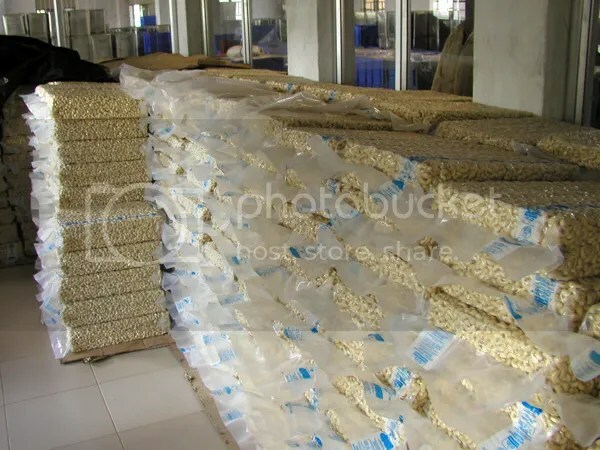 Cashew nuts are then packaged in vacuum in large packs (greater than 10kg). Most of the cashew nuts from this factory are exported through bulk dealers. They do have their own private label that you saw above. 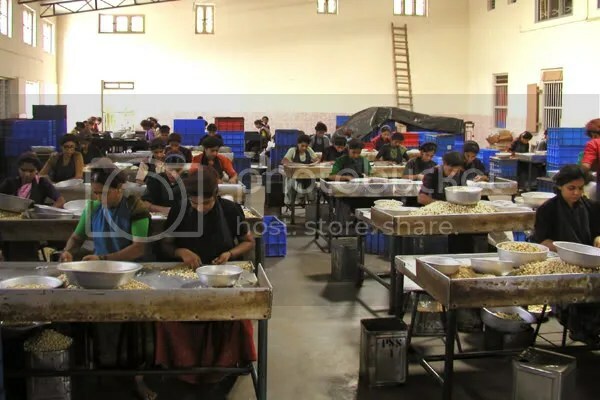 Depending upon the needs of the customer, the factory also does some post processing such as roasting cashew nuts with spices. Note on photographs: All factory pics were shot in Sept 2004 using my Olympus C4040, 4MP point and shoot digital camera, confirming you don&apos;t need fancy cameras to take good pics. I do have a dSLR which I have been using more recently. The opening cashew fruit pic was from an indian cashew trade association website. We are company from Yemen. one of the factories is of my mama’s!! i go there regularly! Yaay! who is your mama? I would like to know what is the best way to tell if cashew nuts are of good quality when purchased. WHat is the normal shelf life of cashew nuts and how can we tell that they are old when purchased.